I needed a break from all the dystopia an somewhat depressing books I’ve been reading lately, and Audrey, Wait! was the perfect one. I found this book while I was browsing in the Fully Booked and bought it impulsively — and now it’s one of the best impulse buys I’ve ever made. Audrey is your normal teenage girl who likes music, goes to concerts, works for an ice cream store, hangs out with her best friend and has a musician boyfriend with an MF taylor guitar in tow. However, the musician boyfriend bit is slowly getting old and Audrey knew that she had to break up with him. After much support and list-making with her best friend Victoria, she finally breaks up with Evan in the most gentle way she knows how, and plans on moving on quietly. Nothing spectacular about that, right? Except for two things: Evan finally found the inspiration to write a song about Audrey after she broke up with him, and they played it on their gig the next night where this bigwig producer was watching. And the song was good. Very good. Wait, that was three things. Or four. Audrey’s normal life gets turned upside down as The Song becomes a hit. Pretty soon Audrey gets mobbed by fans, chased by papparazzi, kissed by wannabe rockstars hoping for inspiration, and basically loses every bit of privacy she knows. 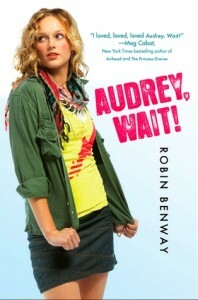 All the while Audrey can’t wait for everything to die down — the question is, will it ever? Audrey, Wait! is such a fun book. I love contemporary YA, but I do get sick of having to deal with characters who have dysfunctional relationships with their families, or have body image issues, or friendship issues or any other kind of issues. Sure, no one is perfectly adjusted even in books, but it’s nice to read about someone who has a good life who just happened to make the right decision at the wrong time. That’s Audrey. She’s probably the most normal character I have read in contemporary YA ever. She has good friends, good grades and even a friendly relationship with her parents. It’s comforting to read something like this because it shows that you don’t need to be a messed up protagonist to have a story — sometimes normal in extraordinary situations would work just as fine. Audrey’s voice was clear and distinct, and she often breaks the fourth wall in the story since she’s basically re-telling it to us (Example, on page 241: “He, Victoria and my parents were the only one who had my cell number, because someone — and if you’re reading this, I will find you, oh yes, I will — hacked into my phone and got the number…”). She’s snarky most of the time, but she’s also lovable and I can’t help but sympathize with her as the story went on. The love interests are also very fleshed out. Evan disappears to be on tour soon after they play the hit song, but his presence was never gone in the story. He is the so-called antagonist that redeemed himself in the end without glossing over his flaws and offenses. James, on the other hand, is a sweet and sensitive guy that took Audrey (and me) by surprise. He’s one of those male YA characters that you can’t help but like, and maybe even have a crush on? :P He isn’t my type of guy, but I thought he was a cute and well-characterized male character. “I just want you to know that, okay? I don’t want you to be scared that I can’t handle his. I mean, you know, whatever this is.” He waved his hand to indicate the general insanity that had taken over my life. don’t date someone who will write a song about you when you break up and make it big after.